Ricardo David Vargas joins Cal Aquatics’ Long Gutierrez and Lilana Ibanez on the Mexican Olympic Squad. Canada’s Santo Condorelli had a very convincing win in the men’s 100 freestyle on the final night in Charlotte. 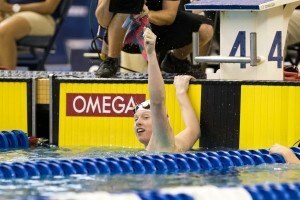 Lilly King was victorious on the final night of racing at the Arena Pro Swim Series in Charlotte in the 50 breast. Dana Vollmer put down the fastest 100 free time by an American female this year in prelims this morning. Since coming out of retirement last summer, Dana Vollmer has made a splash in more than just the 100 fly. 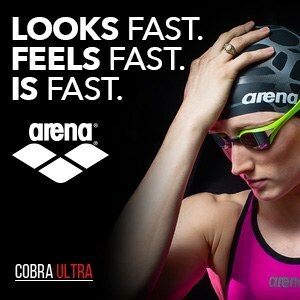 This morning in Charlotte at Arena Pro Swim, she swam textile best 53.59 in the 100 free to grab top seed. The Arena Pro Swim Series at Charlotte begins this afternoon at the Mecklenberg County Aquatics Center. Just two distance events will be competed this evening: the women’s 1500-meter freestyle and the men’s 800-meter freestyle. With neither of these races being Olympic events, the fields are thinner than the Sunday distance events, but some big names will still be competing. 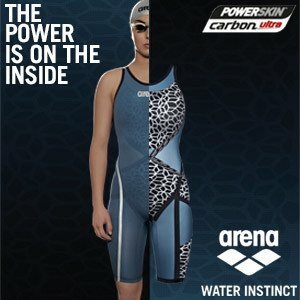 On the women’s side, Cammile Adams, Gillian Ryan, Lindsay Vrooman, and Ashley Twichell are slotted to compete, while the Club Wolverine crew of Connor Jaeger, Michael Klueh, PJ Ransford, and Sean Ryan will swim for the men. Outside smoke. Seeded with a yards time, U.S. National Teamer Ashley Twichell was stuck in an outside lane of the first heat, but she made the best of it, clocking a 16:11.19 for the win. Not only is that good for #2 in the world this season, but it’s more than 10 seconds under her previous lifetime best from 2013. Twichell is much more of an open water specialist (she’s been a routine member of the National Team in those events), so she’s better suited for the 1500 than the 800, but if she can find a bit more speed on Sunday, she could move into the top 8 nationally heading into Olympic Trials in Omaha. Chilean national record holder Kristel Kobrich hung with Twichell for much of the race, and for a while even looked like she may have a chance to close the gap. Ultimately, she settled for second in 16:16.15, a bit slower than her 16:13.54 from earlier this season. Michigan’s Gillian Ryan was a distant third in 16:32.21. Notably, in heat two, Cammile Adams of SwimMAC Elite and Verity Abel of Duke both sprinted the first 800 meters in an effort to hit the Olympic Trials standard of 8:49.99. Both swimmers were successful, with Adams touching in a very respectable 8:33.79 (top 16 in the U.S. in this Olympic cycle) and Abel sneaking in at 8:49.52. 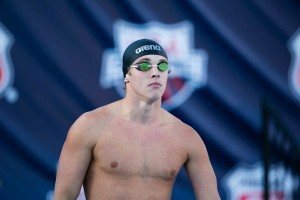 Former Auburn All-American and current U.S. National Team member Zane Grothe went out hard, splitting under 30 seconds on each of the first 5 50’s and flipping first at the halfway mark, but Olympian Connor Jaeger reeled him in over the next 200 meters and pulled away for the win in 7:54.49. Grothe hung tough through the rest of the race, but Jaeger closed in 59.3-58.2 over the final 200 to seal the victory. Overall, Jaeger moved into 8th in the world this season with that effort. Four years ago, this meet (then called the Charlotte UltraSwim) marked a key weekend in American distance swimming, with both Jaeger and Katie Ledecky “announcing” their arrival as contenders at Trials in Omaha. That weekend, Jaeger cut 3+ seconds of his 400, 22 seconds off his 800 (finishing in 8:00.81, around 6 seconds slower than he was this evening), and 28 seconds off his 1500 to earn top three finishes in each event. Four years later, it will be interesting to compare where Jaeger is at the end of this weekend. Marcelo Acosta, who earlier this season became the first El Salvadorian to qualify for the Olympics with an “A” cut in the 1500, was third in 8:05.79. Very good swim by Jaeger. He’s in the category of the few US swimmers who have the luxury of not needing a full taper for trials to qualify. 7.54 right now is a very solid time. By the way, always my same request. Can you please mention clearly the top 3 in each event with the names and the times? Especially instead of these huge rankings of the year which take too much space. The guy who arrives quickly on that page and quickly reads that page can believe that these rankings are the results of the races. Thanks. Starting off the results (before the descriptive article) with the top 3 finishers in the event would be great; personally, I think a listing of the top 8 finishers would be even better. Thanks for your reporting, Swimswam staff!